Investment Thesis: Our fundamental belief is that open collaboration and active participation drives successful ventures. Our team consist of advisory board members and investment operators that have extensive experience in their particular discipline. We deploy our operators to actively participate in managing the day-to-day operations, which allows the entrepreneur focus on what they do best. Collectively the team works together to execute the strategic plan. Our advisory board members are mentors and are always willing to make proper introductions when needed. Our proven approach will reduce the traditional investment period in order to achieve the highest realization returns for our investors. Moreover, our investment thesis ensures the personal and professional goals of the entrepreneur are also satisfied. Investment Process: The pre-screening discussion is to determine if an investment target is a platform business or a component technology. Once we believe we have a general consensus, we then employ our five step investment process to partner with the entrepreneur to achieve a successful venture. 1) Identify a need - Our investment thesis is our main driver in searching for a need. We are not perfect, sometimes the need is presented to us by you. This is why we encourage you to submit an inquiry or executive summary. 2) Complete due diligence - Once we determine you have a great idea, we schedule a face-to-face meeting with you to allow you to present your idea to us. If we, including yourself, collectively feel we have a good fit, we begin the process of checking your references, verifying that your financials are in reasonable order, validating your idea with our network of professionals, etc. 3) Risk assessment and valuation - We employ a scorecard method in which both industry accepted analytical data in conjunction with our team’s empirical data. The scorecard determines what the pre- and post-money valuations will be. Our valuation will be one of the foundations you must agree to move in order to move on to the next step. Your participation is crucial because your honest involvement with our team determines the scorecard results. 4) Negotiate terms to close - Our preference is to invest using Series Seed Preferred Stock templates. We make the financing simple keeping in mind the less complicated we start a deal structure the easier it is for the next round of investment or exit. 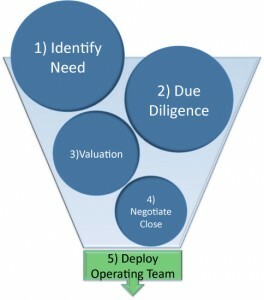 5) Deploy a team of operators to the target in order to help execute the agreed upon objective and strategic plan.